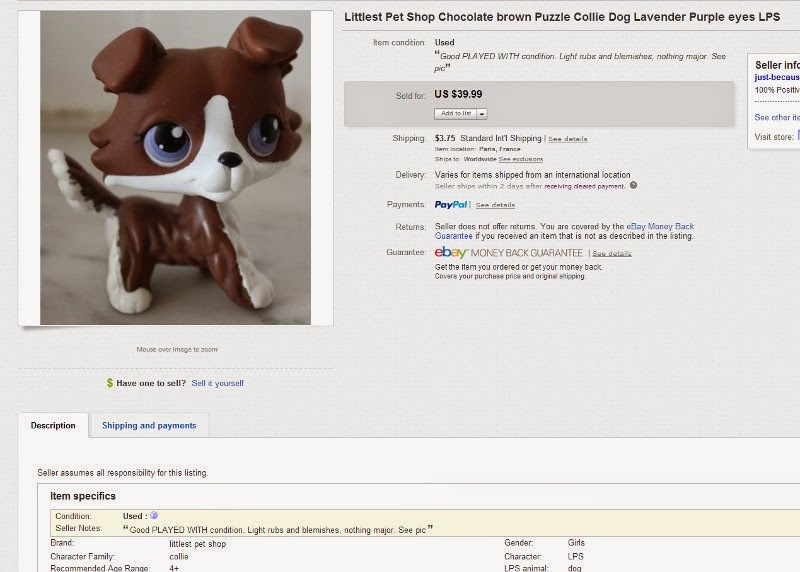 Yard Sale Finds Sold on Ebay: Remember the 2 Littlest Petshop Collie Dogs? A few weeks ago I bought 2 LPS for about $1.50 each (see this post: http://myyardsalefinds.blogspot.com/2014/05/yard-sale-finds-littlest-pet-shop.html) I sold both rather quickly and for good money: $19.99 and $39.99. Now a little warning about LPS sold by Chinese sellers: these are fake! Do not buy LPS from sellers located in China. 99.9% are fake/counterfeit Littlest Pet Shop. If you buy them from China sellers for cheap and try to sell them back for profit you may end with item not as described cases against you! LPS are not the only fake, cheap and low quality products coming from China, almost everything sold by China seller is fake, counterfeit and bad quality and buyers have a hard time getting refunds. Ebay is harboring and helping the dumping of cheap quality knockoffs since they allow China sellers on their site a few years ago. And it is only getting worst. Some categories are overrun by them. try searching for vintage silver jewelry and you will see what I mean: vintage that is not vintage and silver that is not silver. yet eBay let them run free although they give "bad buyer experience".